The name Polar would definitely resonate with those who are involved with sports and fitness gadgets, as Polar has come up with its fair share of such devices including the Polar M400 GPS training watch. They happen to be the most trusted heart rate data provider when it comes to elite level clubs and national teams in all major team sports including NFL, NBA, NHL, MLB, MLS and U.S. Olympic sports. Hence, it is far from surprising to see Polar come up with the Polar Team Pro, which is the most advanced team sports coaching solution to date. The Polar Team Pro was specially designed in order for it to meet the demanding needs of fitness, strength and conditioning coaches who work in top-tier team sports. 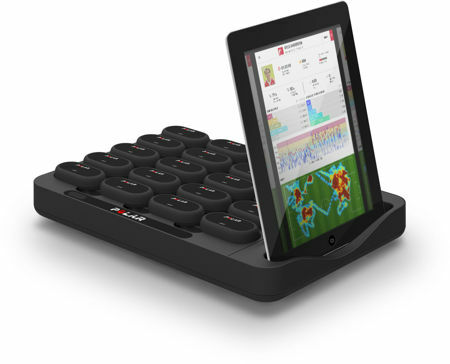 This particular high-performance Polar Team Pro hardware will comprise of sensors that all players will wear, where there is also an accompanying dock that enables quick data transfer as well as charging capability. Touted to be the world’s smallest and lightest all-in-one sensor for team sports, it tips the scales at a mere 38 grams, and players will not have to go through the hassle of wearing any kind of additional vests or belts. The sensor will effortlessly merge GPS as well as motion tracking technology alongside heart rate, hence offering extensive and most accurate performance data. Not only that, it is capable of measuring speed, distance and acceleration when it comes to running-based sports indoors, and live data will be captured onto the coach’s iPad (as long as it remains within a 200 meters range) without the need for external base stations through Bluetooth Smart. The Polar Team Pro app for iPad delivers objective data and analysis on key performance indicators, as the coach picks up instant analysis with detailed player statistics as well as data over the session, in addition to player comparisons. Such information can be vital to assist teams and coaches optimize training and recovery patterns, hit their targets and prevent injuries. Team members are able to hook up their own Polar wearables such as the V800, M400, A300 and Loop with the Polar Team Pro web service, too, letting coaches enjoy more insight on players’ daily activity, recovery status and sleep. Out later this month, the Polar Team Pro will arrive in packages that include an annual license to access the Polar Team Pro app for iPad and web service and Polar Team Pro hardware that includes the Team Pro dock, ten sensors, ten chest straps, a washing pouch and a sensor folder.